A M Kedir, Schooling, BMI, Height and Wages: Panel Evidence on Men and Women. K Elmawazini and S Nwankwo, Globalisation and Income Gap between Rich and Poor Nations. T Sharpe and M Watts, Unconventional Monetary Policy in the UK: A Modern Money Critique. Y Tan and C Floros, Market power, stability and performance in the Chinese banking industry. J M Andraz and N M Norte, Output volatility in the OECD: Are the member states becoming less vulnerable to exogenous shocks? S C Dow, Foundations for new economic thinking: a collection of essays. Charles Whalen (ed. 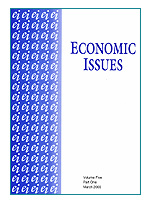 ), Financial Instability and Economic Security after the Great Recession. R Layard and S J Nickell, Combatting Unemployment. W Lazonick and D J Teece (eds), Management Innovation: Essays in the Spirit of Alfred D. Chandler Jr.
Claudio Sardoni, Unemployment, Recession and Effective Demand: The Contributions of Marx, Keynes and Kalecki. John Eatwell and Murray Milgate, The Fall and Rise of Keynesian Economics.